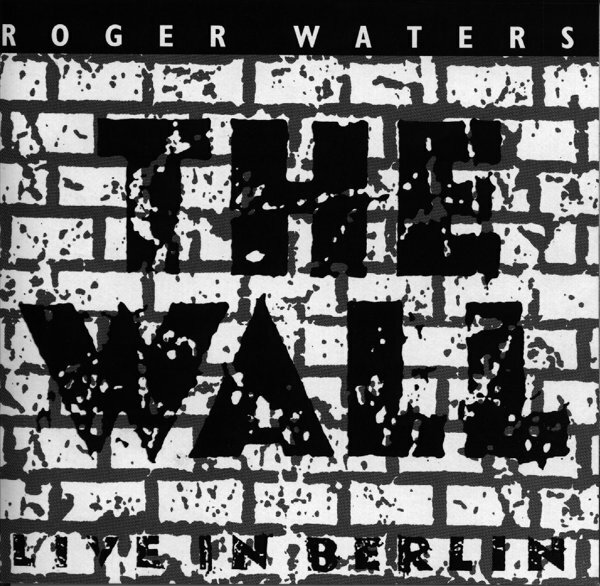 The Berlin Wall (German: Berliner Mauer) was a barrier constructed by the German Democratic Republic (GDR, East Germany) starting August 13, 1961, that completely cut off West Berlin from surrounding East Germany and from East Berlin. The barrier included guard towers placed along large concrete walls, which circumscribed a wide area (later known as the "death strip") that contained anti-vehicle trenches, "fakir beds" and other defenses. The Soviet-dominated Eastern Bloc officially claimed that the wall was erected to protect its population from fascist elements conspiring to prevent the "will of the people" in building a Socialist State in East Germany. 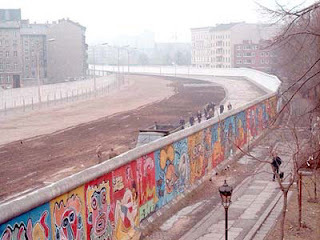 However, in practice, the Wall served to prevent the massive emigration and defection that marked Germany and the communist Eastern Bloc during the post-World War II period. The Berlin Wall was officially referred to as the "Anti-Fascist Protection Wall" (German: Antifaschistischer Schutzwall) by GDR authorities, implying that neighboring West Germany had not been fully de-Nazified. 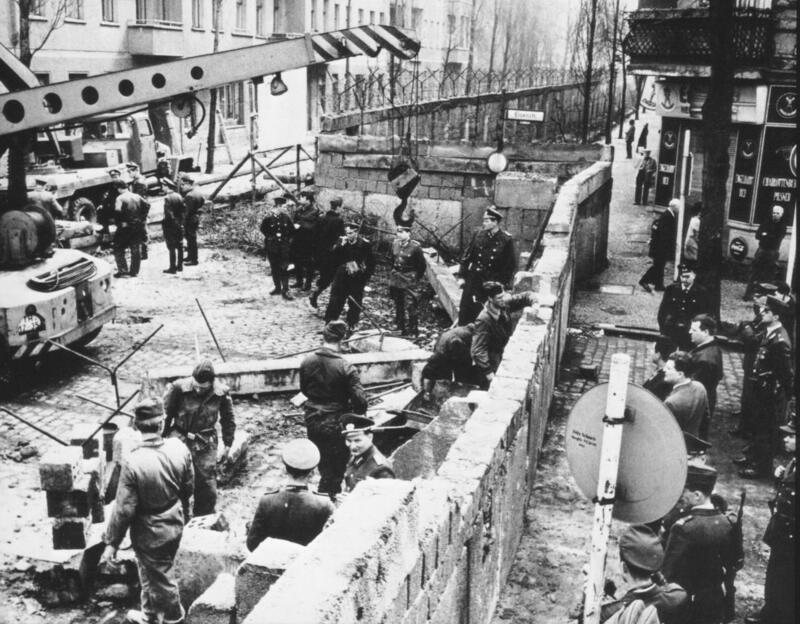 The West Berlin city government sometimes referred to it as the "Wall of Shame" – a term coined by mayor Willy Brandt – while condemning the wall's restriction on freedom of movement. Along with the separate and much longer Inner German border (IGB) that demarcated the border between East and West Germany, both borders came to symbolize the "Iron Curtain" between Western Europe and the Eastern Bloc. In 1989, a radical series of Eastern Bloc political changes occurred, associated with the liberalization of the Eastern Bloc's authoritarian systems and the erosion of political power in the pro-Soviet governments in nearby Poland and Hungary. After several weeks of civil unrest, the East German government announced on November 9, 1989 that all GDR citizens could visit West Germany and West Berlin. 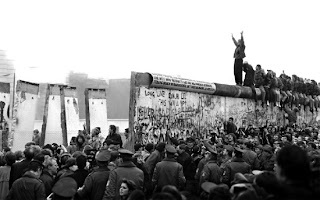 Crowds of East Germans crossed and climbed onto the wall, joined by West Germans on the other side in a celebratory atmosphere. Over the next few weeks, a euphoric public and souvenir hunters chipped away parts of the wall; the governments later used industrial equipment to remove most of the rest. 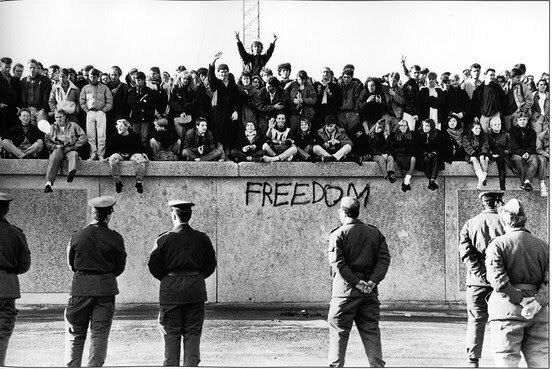 The fall of the Berlin Wall paved the way for German reunification, which was formally concluded on October 3, 1990. After the end of World War II in Europe, what remained of pre-war Germany west of the Oder-Neisse line was divided into four occupation zones (per the Potsdam Agreement), each one controlled by one of the four occupying Allied powers: the United States, United Kingdom, France and the Soviet Union. The capital of Berlin, as the seat of the Allied Control Council, was similarly subdivided into four sectors despite the city's location deep inside the Soviet zone. Within two years, political divisions increased between the Soviets and the other occupying powers. These included the Soviets' refusal to agree to reconstruction plans making post-war Germany self-sufficient and to a detailed accounting of the industrial plants, goods and infrastructure already removed by the Soviets. Britain, France, the United States and the Benelux countries later met to combine the non-Soviet zones of the country into one zone for reconstruction and approve the extension of the Marshall Plan. Following World War II, Soviet leader Josef Stalin built up a protective belt of Soviet-controlled nations on his Western border, the Eastern bloc, that then included Poland, Hungary and Czechoslovakia, which he wished to maintain alongside a weakened Soviet-controlled Germany. As early as 1945, Stalin revealed to German communist leaders that he expected to slowly undermine the British position within the British occupation zone, that the United States would withdraw within a year or two, and that nothing then would stand in the way of a united Germany under communist control within the Soviet orbit. The major task of the ruling communist party in the Soviet zone was to channel Soviet orders down to both the administrative apparatus and the other bloc parties, while pretending that these were initiatives of its own. Property and industry was nationalized in the East German zone. If statements or decisions deviated from the described line, reprimands and, for persons outside public attention, punishment would ensue, such as imprisonment, torture and even death. Indoctrination of Marxism-Leninism became a compulsory part of school curricula, sending professors and students fleeing to the west. The East Germans created an elaborate political police apparatus that kept the population under close surveillance, including Soviet SMERSH secret police. In 1948, following disagreements regarding reconstruction and a new German currency, Stalin instituted the Berlin Blockade, preventing food, materials and supplies from arriving in West Berlin. The United States, Britain, France, Canada, Australia, New Zealand and several other countries began a massive "Berlin airlift", supplying West Berlin with food and other supplies. The Soviets mounted a public relations campaign against the western policy change. Communists attempted to disrupt the elections of 1948, preceding large losses therein, while 300,000 Berliners demonstrated for the international airlift to continue. In May 1949, Stalin lifted the blockade, permitting the resumption of Western shipments to Berlin. The German Democratic Republic (East Germany) was declared on October 7, 1949. By a secret treaty, the Soviet Ministry of Foreign Affairs accorded the East German state administrative authority, but not autonomy. The Soviets had unlimited power over the occupation regime and penetrated East German administrative, military and secret police structures. East Germany differed from West Germany (Federal Republic of Germany), which developed into a Western capitalist country with a social market economy ("Soziale Marktwirtschaft" in German) and a democratic parliamentary government. Continual economic growth starting in the 1950s fuelled a 20-year "economic miracle" ("Wirtschaftswunder"). As West Germany's economy grew and its standard of living continually improved, many East Germans wanted to move to West Germany. After Soviet occupation of Eastern Europe at the end of World War II, the majority of those living in the newly acquired areas of the Eastern Bloc aspired to independence and wanted the Soviets to leave.Taking advantage of the zonal border between occupied zones in Germany, the number of GDR citizens moving to West Germany totaled 187,000 in 1950; 165,000 in 1951; 182,000 in 1952; and 331,000 in 1953. One reason for the sharp 1953 increase was fear of potential further Sovietization, given the increasingly paranoid actions of Joseph Stalin in late 1952 and early 1953. 226,000 had fled in just the first six months of 1953. By the early 1950s, the Soviet approach to controlling national movement, restricting emigration, was emulated by most of the rest of the Eastern Bloc, including East Germany. The restrictions presented a quandary for some Eastern Bloc states that had been more economically advanced and open than the Soviet Union, such that crossing borders seemed more natural — especially where no prior border existed between East and West Germany. Up until 1952, the lines between East Germany and the western occupied zones could be easily crossed in most places. On April 1, 1952, East German leaders met the Soviet leader Joseph Stalin in Moscow; during the discussions Stalin's foreign minister Vyacheslav Molotov proposed that the East Germans should "introduce a system of passes for visits of West Berlin residents to the territory of East Berlin [so as to stop] free movement of Western agents" in the GDR. Stalin agreed, calling the situation "intolerable". He advised the East Germans to build up their border defenses, telling them that "The demarcation line between East and West Germany should be considered a border – and not just any border, but a dangerous one ... The Germans will guard the line of defence with their lives." Consequently, the inner German border between the two German states was closed, and a barbed-wire fence erected. 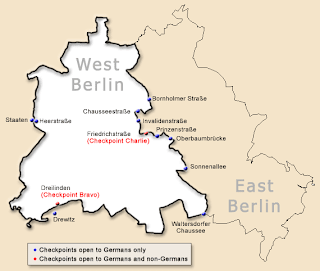 The border between the Western and Eastern sectors of Berlin, however, remained open, although traffic between the Soviet and the Western sectors was somewhat restricted. This resulted in Berlin becoming a magnet for East Germans desperate to escape life in the GDR, and also a flashpoint for tension between the United States and the Soviet Union. In 1955, the Soviets gave East Germany authority over civilian movement in Berlin, passing control to a regime not recognized in the West. 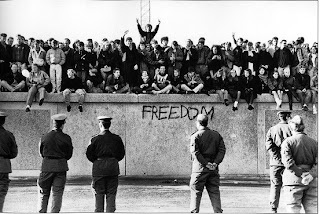 Initially, East Germany granted "visits" to allow its residents access to West Germany. However, following the defection of large numbers of East Germans under this regime, the new East German state legally restricted virtually all travel to the West in 1956. Soviet East German ambassador Mikhail Pervukhin observed that "the presence in Berlin of an open and essentially uncontrolled border between the socialist and capitalist worlds unwittingly prompts the population to make a comparison between both parts of the city, which unfortunately, does not always turn out in favor of the Democratic [East] Berlin." 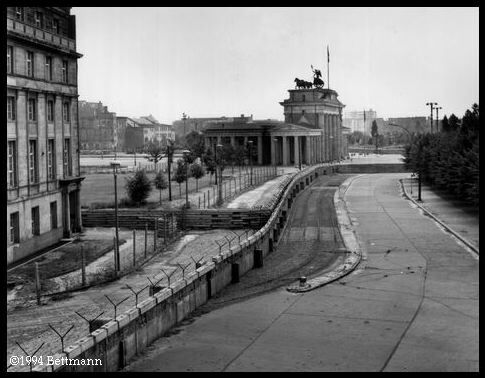 With the closing of the inner German border officially in 1952, the border in Berlin remained considerably more accessible then because it was administered by all four occupying powers. Accordingly, Berlin became the main route by which East Germans left for the West. On December 11, 1957, East Germany introduced a new passport law that reduced the overall number of refugees leaving Eastern Germany. It had the unintended result of drastically increasing the percentage of those leaving through West Berlin from 60% to well over 90% by the end of 1958. Those caught trying to leave East Berlin were subjected to heavy penalties, but with no physical barrier and subway train access still available to West Berlin, such measures were ineffective. 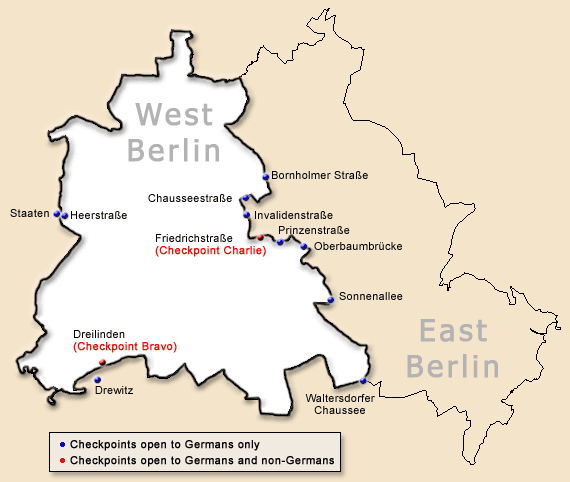 The Berlin sector border was essentially a "loophole" through which Eastern Bloc citizens could still escape. The 3.5 million East Germans who had left by 1961 totaled approximately 20% of the entire East German population. The emigrants tended to be young and well-educated, leading to the "brain drain" feared by officials in East Germany. Yuri Andropov, then the CPSU Director on Relations with Communist and Workers Parties of Socialist Countries, wrote an urgent letter on August 28, 1958, to the Central Committee about the significant 50% increase in the number of East German intelligentsia among the refugees. Andropov reported that, while the East German leadership stated that they were leaving for economic reasons, testimony from refugees indicated that the reasons were more political than material. He stated "the flight of the intelligentsia has reached a particularly critical phase." On June 15, 1961, First Secretary of the Socialist Unity Party and GDR State Council chairman Walter Ulbricht stated in an international press conference, "Niemand hat die Absicht, eine Mauer zu errichten!" (No one has the intention of erecting a wall!). It was the first time the colloquial term Mauer (wall) had been used in this context. The record of a telephone call between Nikita Khrushchev and Ulbricht on August 1 in the same year, suggests that it was Khrushchev from whom the initiative for the construction of the wall came. On Saturday, August 12, 1961, the leaders of the GDR attended a garden party at a government guesthouse in Döllnsee, in a wooded area to the north of East Berlin. There Ulbricht signed the order to close the border and erect a wall. At midnight, the police and units of the East German army began to close the border; and by Sunday morning, August 13, the border with West Berlin was closed. East German troops and workers had begun to tear up streets running alongside the border to make them impassable to most vehicles, and to install barbed wire entanglements and fences along the 156 kilometres (97 miles) around the three western sectors, and the 43 kilometres (27 miles) that divided West and East Berlin. The barrier was built slightly inside East Berlin or East German territory to ensure that it did not encroach on West Berlin at any point. Later, it was built up into the Wall proper, the first concrete elements and large blocks being put in place on August 17. During the construction of the Wall, National People's Army (NVA) and Combat Groups of the Working Class (KdA) soldiers stood in front of it with orders to shoot anyone who attempted to defect. Additionally, chain fences, walls, minefields, and other obstacles were installed along the length of the inner-German border between East and West Germany. 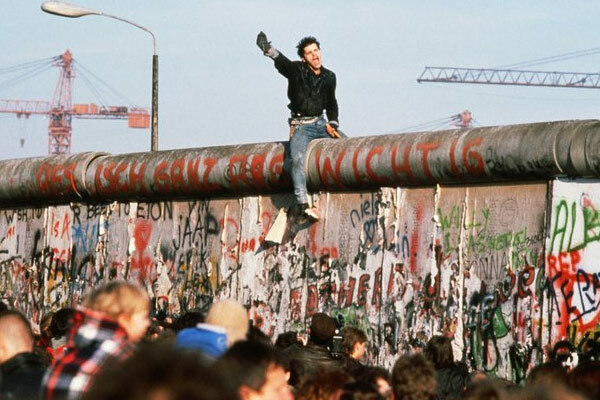 For three decades, it symbolized the chasm between East and West, a brutal, grey barrier which divided a city and was a constantly-simmering focal point of the Cold War. 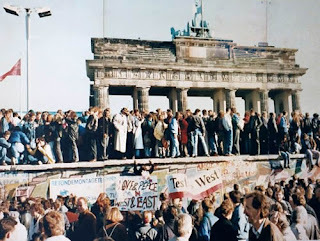 But on November 9, 1989, the long-oppressed citizens of East Berlin broke the first chink in its 96 miles of concrete and barbed wire, signaling the start of one of history's most dramatic political transformations. A simple mistake by an East German official (who announced free transit to the West) unleashed joyful and anarchic celebrations on either side of the Wall. Germans East and West rushed to embrace each other, but how would the Soviets respond? Would they reinforce GDR border guards and fire on the revelers? Would the try to force the gates closed? Would they fire on the West, unleashing World War III? The world watched and waited. Drawing on formerly secret archives from both sides of the Wall and the memories of those who risked their lives to cross the deadly barrier, Declassified: The Rise and Fall of the Wall presents all the detail and drama in a non-stop, fast-moving montage cut to a rock and roll beat. Featuring rare footage, insider reports and interviews with pivotal figures like President George Bush Sr. and Mikhail Gorbachev, this is an unforgettable portrait of a Cold War icon.